On the way to our next stop in Austria, a countryside retreat in the mountains, we stopped off in Hallstatt. The prettiest of medieval towns, perched on the shores of a lake and surrounded by snow capped mountains. Towns just don’t come any more postcard-worthy than this place! The trick in winter is to go early in the day, before the sun sinks below the mountains. That way you’re treated to the most glorious blue skies and piercingly crisp light. Perfect for swanning about and taking it all in. Snow covered streets and chocolate box houses, this place is a photographer’s dream! Forgive me for going somewhat picture mad, I just couldn’t stop myself and I can’t choose which to delete. So I suppose you’ll have to see this as “the director’s cut of Hallstatt”, complete with all the stuff the director (uh, me) is too in love with to cut out. There’s something about the combination of pillow soft powder resting against old wood that just makes my heart sing! It’s the sort of place you walk around with your mouth alternating between wide open and a huge grin. You just can’t help it! 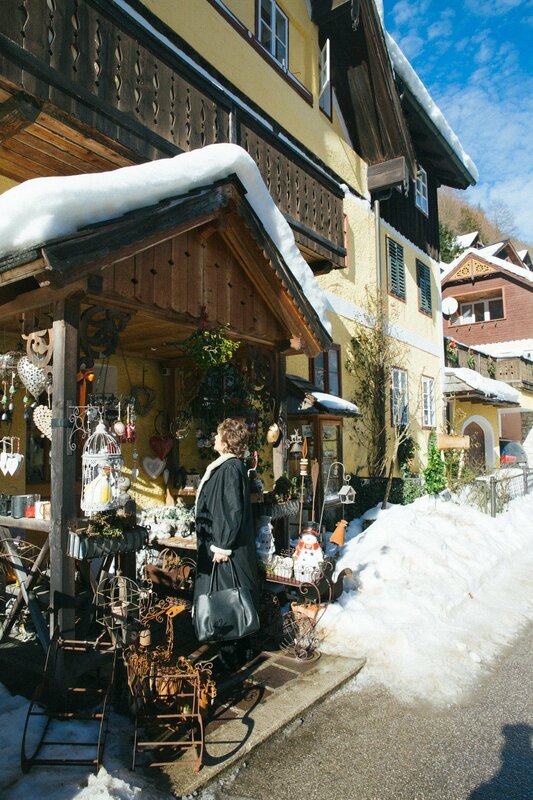 Hallstatt has been a home to unfathomable spectrum of people. A well known Bronze Age settlement with a huge prehistoric cemetery (so far they’ve found over 1400 burials, including 2000 individuals). The town gives its name to “Hallstatt Culture” the main European culture of Early Iron Age Europe from the 8th to 6th centuries BC. Home to the world’s first salt mine it has always been a wealthy town and would have been a thriving centre of trade. Now it’s a sleepy town where the locals never have to lock their doors. Mostly filled with houses all piled on top of each other, with the occasional shop thrown in for good measure. Every jetty out into the lake makes for the most incredible vantage point. Press play on the video below for a better look and listen. As with much of Austria and southern Germany, the houses are often painted in the prettiest of pastel colours. Slotting in together and complimenting each other perfectly. Finally hoodwinked someone into taking a picture of us together! Straight to the printers it goes. The higgledy piggledy town stretches out across the base of the mountain, climbing up and stopping quite suddenly at the water’s edge. We couldn’t help but think of what a wonderful place it must be to live. Snuggling up in winter, fishing from the window and swimming all summer. At the far edge of town is where you’ll get the very best look back at it. There are a few cafes and restaurants around for you to choose from for lunch. Though there aren’t too many open in the winter months. We went for a very pretty hotel on the front with a deck over the lake. Dined on trout fresh from the lake, toasted our luck with bubbles and finished off with apple strudel. We walked over to the edge of town one last time to see the sun set over the mountain. Rays glittering down onto the town. And finally went on our way just as we were plunged into an exceptionally cold blue afternoon. Hallstatt is only about an hour and a half outside of Salzburg and I thoroughly recommend popping by if you get a chance! It is truly, truly lovely.